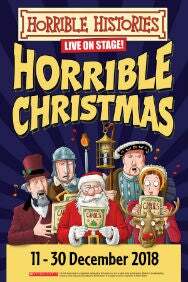 We do not curently have theatre tickets available for Horrible Christmas This could be because we have simply sold out or it could be that this show is no longer running. The information on this page remains purely for historical and informational purposes. When Christmas comes under threat from a jolly man dressed in red, it’s up to one young boy to save the day  but can he save Christmas? From Victorian villains to Medieval monks, Puritan parties to Tudor treats, join us on a hair-raising adventure through the history of Christmas in the company of Charles Dickens, Oliver Cromwell, King Henry VIII, St Nicholas and Rudolph the Red Nosed Reindeer as they all join forces to save the festive season!